Skyward Flight Training are holding a spot landing competition – open to all! This exciting event will take place mid-September, date to be confirmed. All that’s required is a current licence and medical. Students can participate if they are accompanied by an instructor. We will be using the two club Cessna 152s, and participants will fly two circuits with a full stop on the second landing. You will pay just 20 minutes flight time (currently £51.00 incl of VAT). 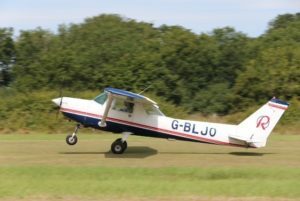 Judging will be carried out by our own CFI, Chris Shepherd-Rose, with two prizes awarded each consisting of a full hour of flying in a Skyward Cessna 152 (sponsored by a club member). These will be awarded for the two closest “spot” landings in the judge’s opinion, whose decision will be final. On completion of your final landing, aircraft will taxi to a marked position at the runway/taxiway intersection and turn to face down the taxi way looking towards the active runway. Pilots and passengers will carefully disembark under stewards directions leaving engine at full idle, vacating the aircraft TOWARDS THE REAR. On no account are pilots and passengers to leave towards the FRONT of the aircraft! Any instruction given by the stewards must be followed at ALL TIMES. Remember: Safety is no accident! It is our number one priority to ensure each of us has a day to remember, for the right reasons! The next contestants will embark from the rear of the aircraft, again under steward’s directions. Important: Please note that power checks will not be required, but pre-take off checks will be. Vital actions MUST be carried out, especially setting correct take off trim. Standard radio calls to be made whilst in the circuit. Photographs will be taken of all landings and available by request. Please indicate if you wish to participate in this fun event by contacting Skyward. It will be a chance to show off your landing skills and have the chance to win a worthwhile prize! Dependent on numbers (hopefully lots of you will sign up) we may add a BBQ lunch at £5.00 a head.